I have learned, after 26 years of marriage and 22 years as the mom, that I have to be the one to touch the mail first. Everyone else in my house just grabs it and throws it on the table, or the couch, or the desk or the "wherever it lands" place. This is not me criticizing about the other people in my house. This is me saying that some people are wired for this and some are not. Every personality is different and great at different things. I happen to be good at the mail. Take a look at this article describing the different ways that people choose to deal with paper and mail. It is AWESOME! It is VERY insightful. I don't lay it down. I take it and deal with it IMMEDIATELY. That is key.... The first thing I do when I touch the mail is separate it all into four basic categories. 1. Junk Mail - goes straight to the shredder or trash depending on the type of junk it is. Any application or solicitations that have private info on them gets shredded. Fliers get the trash can. This link is a great infographic (and this is the article) with information about how to opt out of junk mail and be removed from certain junk mail lists. I did that some time ago and we get very little junk mail outside of the odd grocery/coupon fliers and local adverts. 2. Bills and Important Documents/Papers - they go straight to Dan's "incoming bill" place because he pays the bills. Once he pays them he files the things that need to be filed and shreds the other stuff. I also put his personal mail with the bills so he sees it. He is not allowed to see any other mail because of, what I call, the "Deer in the Headlights Overwhelmed" reaction. We avoid this for him as much as possible because he is a crazy busy person. He is grateful.... I can assure you. 3. Other People's Stuff - I have a kids' mail pile because, as they get older, it comes more and more often. What kind of mail do your children get? With colleges contacting them, bank statements coming, personal magazines or school mail, letters from friends or invitations to parties and such, it can pile up. Even with technology we still have these things come in the snail mail. Most of it gets designated to them for them to deal with unless Dan and/or I have to help them deal with it. 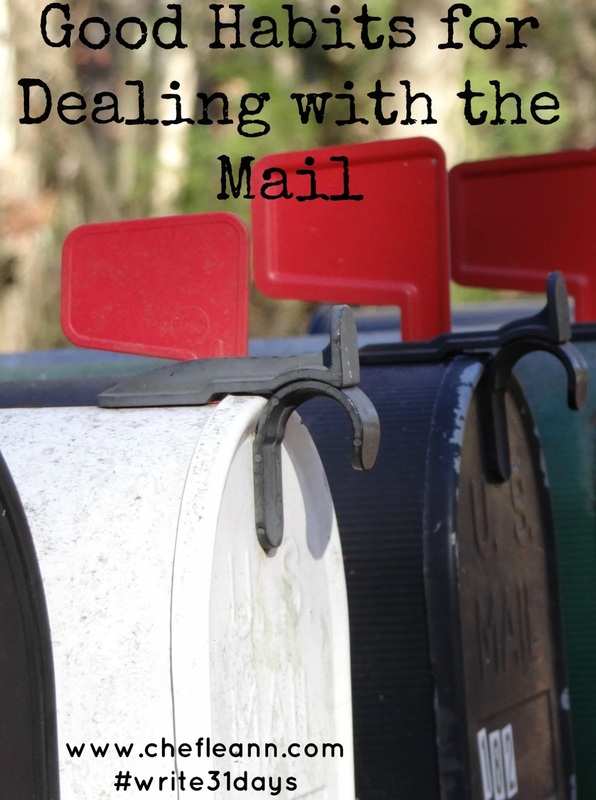 When you have an unmarried younger adult child in the military or away at college you often have to collect their mail to forward to them or to open with their permission and deal with things over the phone. It is a necessary part of that transition because they may move every 3 to 4 months for a few years. I don't make decisions on my big kids' stuff as much as I just inform and ask what they want me to do with it. I shred most of that stuff, too. I love my shredder! It is a crucial tool when dealing with mail. 4. My Stuff - mine includes one magazine subscription, the occasional books for review or just for me and other random things that come. Sometimes there are grocery items or personal items I order. I open and stash things right away to keep from having piles around the house to deal with later. Once I am done the right people see the right thing and nothing is lost in the shuffle. It is important to have a system and someone in your house should take that job. For our house it is me. Would it be more organized if I had a better system? Yes... and as our house gets purged of the excess more and more I want to refine this system. Do you have a system for dealing with incoming mail?